From time to time there may be a need to refer you and your pet to another veterinary surgeon. This may be to access a higher level of expertise or of facilities than we are unable to provide at Westwood. We will seek to arrange referral to a practice with the appropriate skills, experience, qualifications and equipment needed. We will endeavour to arrange this within reasonable travelling distance. We will forward your pet’s history and the results of any diagnostic tests to the practice. There is a charge for this service which may not be covered by your pet insurance policy. Any clinical fees are directly payable to the referral practice and you should ask for an estimation of anticipated costs. Should you wish to seek a second opinion on your pet’s treatment or diagnosis then the first point of call would be to speak to the Clinical Director (Elizabeth Askew) at Westwood. This may be arranged within the practice at no additional cost. You may wish to seek an opinion from another practice, in which case you should contact them directly to make an appointment. You should make them aware that you are seeking a second opinion so that they may request the treatment history and the results of any diagnostic tests from Westwood. We will endeavour to forward this information before your appointment with them. We can now offer laser therapy to our patients! Laser therapy can be used in many situations to help your pet – why not speak to us today to find out more. Laser therapy is not just for dogs and cats. It can be used in all pets, from gerbils and rabbits to lizards and parrots! Dominique has a strong veterinary-based background after she completed a BSc (Hons) in Veterinary Science at The Royal Veterinary College in London. 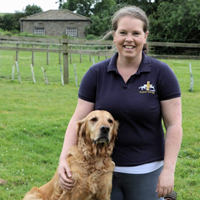 In 2012 Dominique went on to study her postgraduate course in Veterinary Physiotherapy at Harper Adams University which she successfully completed. Dominique joined forces with her sister Zara Mitchell to form Yorkshire Animal Therapy. Dominique specialises in puppy and geriatric exercise plans, pain management, management of conditions such as; arthritis, hip/elbow dysplasia, post surgical rehabilitation, neurological/ spinal rehabilitation and working dog and agility dog strength and conditioning plans. Away from her career as a Veterinary Physiotherapist Dominique has always indulged her passion for owning and caring for animals be it dogs, cats or horses. In her free time she enjoys nothing more than spending a day out at our parents farm with her husband Simon and children Sebastian and Isabella.